The world of work is loaded with lots of twists and turns. I love (kidding myself that I’m actually able) to be in control. The pace is simply too fast to stay ahead. The rush I get is trying to balance all of my responsibilities in the moment. 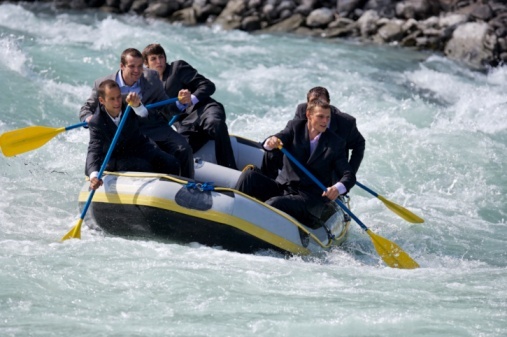 Think white-water rafting in a power suit. For me, it’s no longer about taking the time to step back and plan a neat little strategy that feels so perfect that it’s impossible to fail. That’s what inexperienced leaders think actually happens. The reality for me is to balance all of the action, the waves, the hits, the setbacks, and the think-fast-on-your-feet moments that separate progress from stagnation. So how do you know when you’ve moved from a panicked leader who is scared to make a mistake, to one who is looking for the next wave of treacherous challenges with anticipation? You’ll know because the work will feel different. You’ll know because the butterflies you used to feel will now get you fired up. You’ll know because you won’t want any other member of the team to handle the big stuff. Work isn’t really like war. But that doesn’t mean you should’t get yourself pumped up like never before. This week could be the biggest week of the year. But only if you decide to make it so. Are you ready?